I've always been a grocery list kind of person. In the past, I would scribble down 5 or 6 meals that I would be able to make for the week, think of all of the snacks my family would like to eat, and make the list! It was a daunting task! I dreaded doing it every week. I'm not sure why it was such a process considering I only had a list of about 7 or 8 different meals that I could/would make! As I was learning how to eat right, a friend of mine passed along a weekly meal planner template to use for planning my meals each week. It was a different task for me because I never really kept the paper that I scribbled my weekly meals on, I just used it to figure out what ingredients I would need! In addition, I certainly never planned out any of my meals other than dinner! In the beginning, I thought it was kind of crazy to plan our meals like this! Those of you who personally know me know that I am probably borderline OCD when it comes to cleaning and organization; however, one area that I always lacked was meal planning and preparation. I would actually think to myself throughout the day, "what in the world and I going to make for dinner tonight!" Once I had kids, things got worse because I didn't have time to waste once I got home for the day. When I started using the meal planner template and really sitting down for maybe 10 to 20 minutes on Saturday or Sunday morning to figure out my meals for the week, things drastically changed for me! I found myself searching for different clean eating recipes online. I made it a goal of mine to add one new dinner each week so that the family menu could begin to expand. 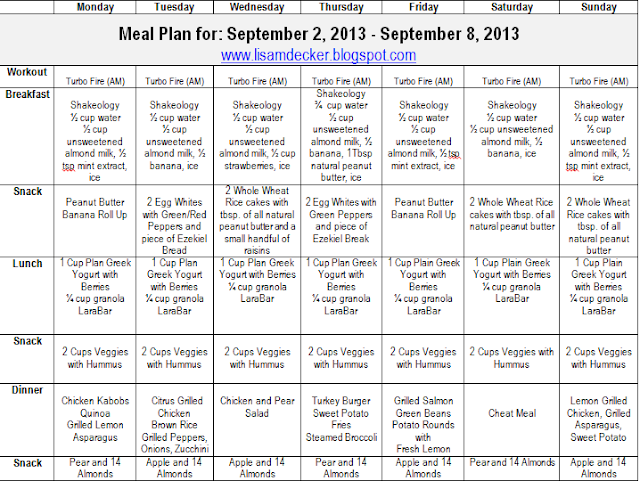 I felt that after the first couple of weeks doing this, meal planning got easier and much better organized. I really had to re-evaluate my snacking throughout the day. Although my dinner planning needed some work, I think it was what I ate the rest of the day that affected me. It was so easy to open the pantry door and pull out a handful of Goldfish crackers, or a fiber bar every now and then. I NEVER kept track of my snacks and didn't really think about what I was eating. I just added it to the grocery list and it became part of my routine. Looking back, I KNOW that was my downfall. Having a meal plan that lays out my entire day of eating has been one of the biggest additions in my continual success. So what do I do after I plan out my meals? Once the chart is filed out, I print it out and keep in on my refrigerator or counter. I hold myself accountable for what I have on the chart, so I want to make sure it is always visible for me when I am in the kitchen. I make sure that my chart includes 6 meals a day (although I do sometimes skip out on my evening snack). I try to make sure that each snack I eat includes a complex carb and a protein. I also incorporate a cheat meal, typically on the weekend. 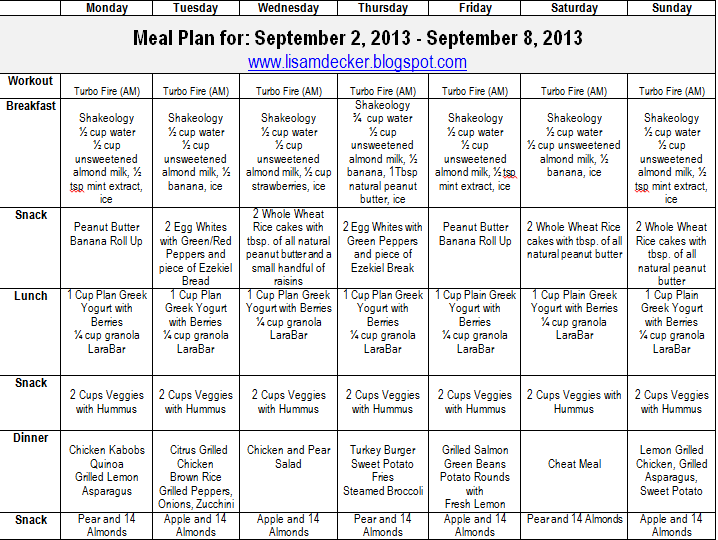 Here is my meal plan for this week! Now that the grocery shopping is done, the real key comes into play. Preparation. Again, something else I never did in the past! So once I have everything home and unpacked, I begin prepping my meals for the week. I portion out my almonds, clean my fruit, cut up and portion out my veggies, and get started on anything that could help me prep for my weekly dinner; for example, I make grilled chicken salad as a dinner once a week so I make sure to get the lettuce cleaned and stored. Anything that gets refrigerated I place on a shelf that is eye level, that way, when I open the door it's right there in front of me! It sounds like a lot of work, but it really isn't once you make it part of your weekend routine. I usually spend about 30 minutes every Sunday doing this. It saves A TON of time throughout the week because all I have to do is grab and go! Does this sound like a routine that you would like to get yourself in to? Do you need help in your meal planning? I have the tips to help you get there! Feel free to email lisamariedecker@yahoo.com or message me to get more information!